Green building, circa 1976. With help from friends and family, Martin Holladay built this woodshed in the mid-1970s. Martin is the shirtless guy sitting on the beam, to the left of the tall post supporting the ridge. 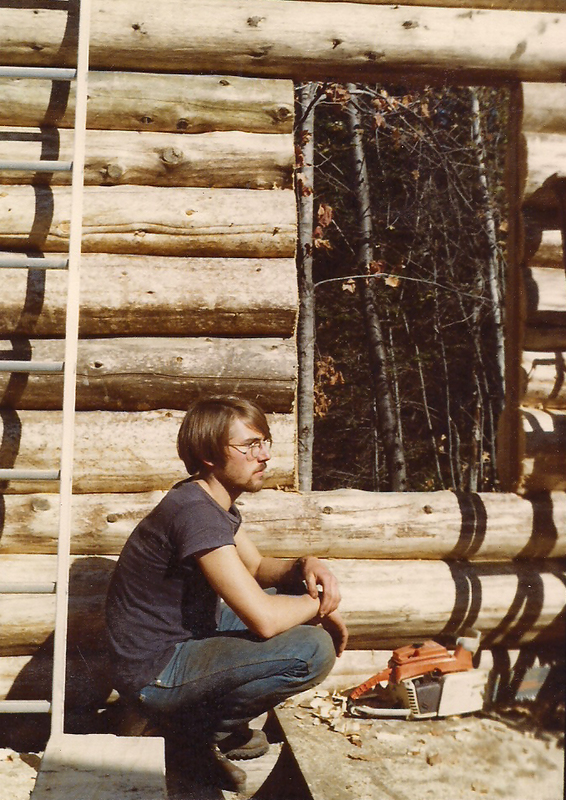 Image Credit: All photos by Martin Holladay or his friends and family In 1976, I helped my friends Bill and Wendy Gessner build a log house. Bill and Wendy skidded the logs to the building site with their two oxen, Jake and Daniel. (Bill whittled the ox yoke with a drawknife.) 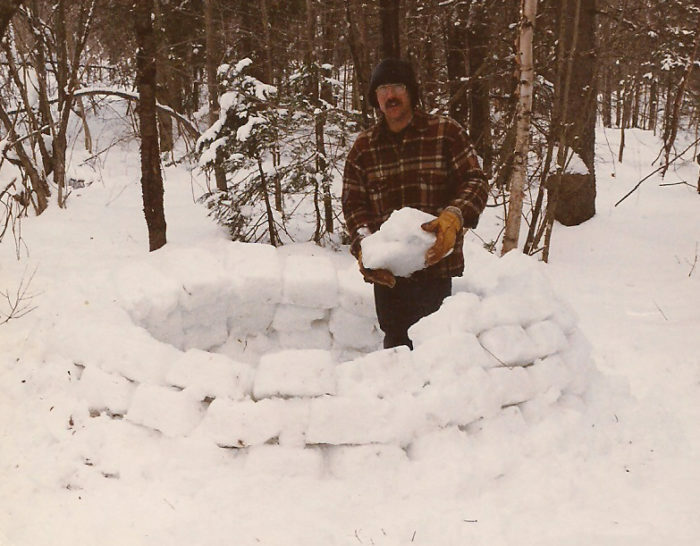 Building an igloo in the mid 1970s. My brother Peter and I are working on the water line. Peter is in the rear of the photo. Clearing land for my house. This spruce tree became a floor joist for my house. Using an adze to smooth the top of a floor joist. Laying stone for my cellar. In this photo, I am trying to figure out what to do next. I was working on a cellar that I built after the house above it was already completed. Installing a sill beam for my house. The built-up beam was assembled from 2x10 floor joists obtained for free from a demolition site. Working in the garden. A discredited theory of embryonic development held that “ontogeny recapitulates phylogeny” — in other words, that the the developmental stages of an embryo (its ontogeny) mimic the stages of evolutionary development experienced by the species (its phylogeny). One piece of evidence supporting the theory: in early stages of development, a human embryo has a tail. Those defending the theory pointed out that a human embryo starts out as a collection of cells; later, it looks like a frog. As it develops, the fetus may resemble other species; but eventually, when fully developed, the result is a human baby. My own story may serve as a typical example. When I first moved to the land where I now live, I slept in a tent and cooked over an open fire. With the help of friends and family, the land was (very slowly) developed. 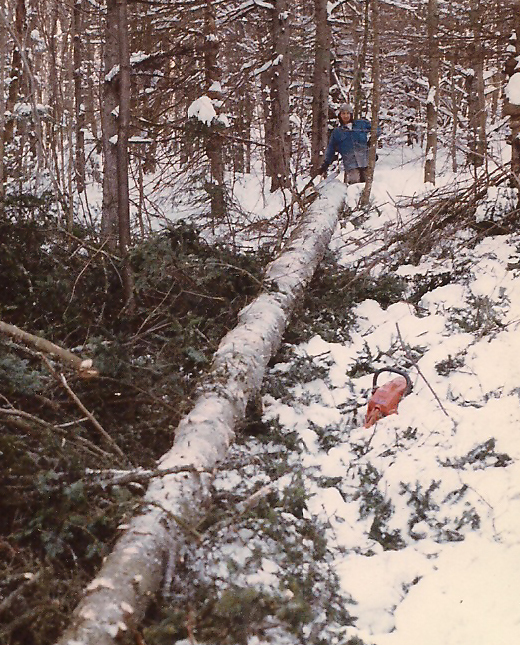 Since the road to our clearing in the woods was rudimentary, and our vehicles were patched together with baling wire and duct tape, transportation was often on foot or by ski. Our toilet facilities were the same as those used by backpackers: the woods. Our first project was to build an outhouse. While the outhouse was under construction, we looked around for a source of water. Eventually we found a wet patch of soil in the woods. We dug it out with a shovel, installed an old barrel, and we had our first spring. Later, we ran a hose downhill from the barrel, thereby re-inventing plumbing. 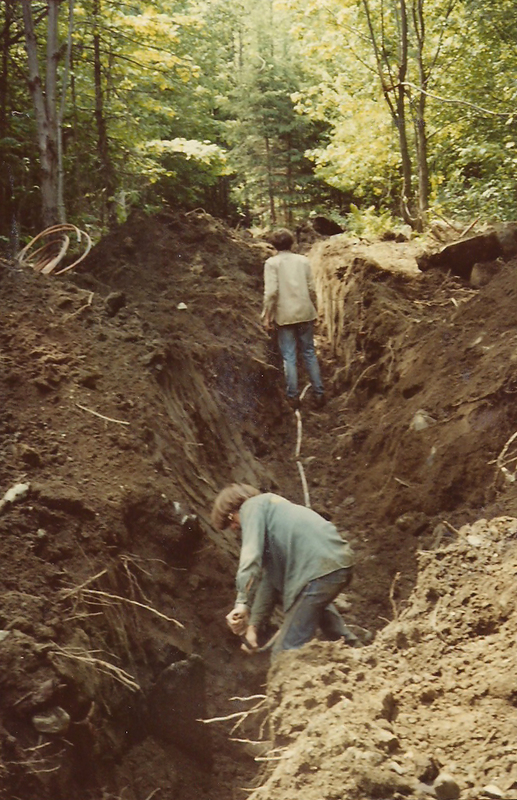 Much later, we hired a backhoe to dig a trench between the spring and the house. We installed concrete well tile at one end of the trench, and a hose bib at the other. We backfilled the trench by hand. Eventually, we built a one-room cabin on a foundation of wooden piers (old telephone poles). Since the cabin lacked a basement, the water pipe and drain pipe froze. During the first winter, our source of drinking water was melted snow. We used kerosene lamps for lighting. Over the years, our technology improved. We eventually bought a photovoltaic module to charge an old car battery that powered a radio and a tiny fluorescent light. Using a shovel, I dug a cellar under the house to keep the pipes from freezing, and we then had a sink with cold running water. 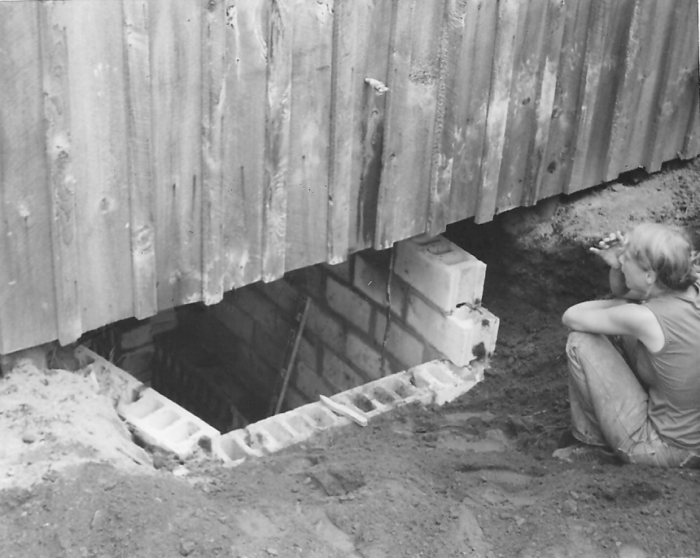 By hand, I dug a hole for a septic tank, and built the tank myself out of concrete blocks and a homemade lid I fabricated from concrete mixed in a wheelbarrow. Using a shovel, I dug trenches for a leach field. Eventually, the house got an addition that included a water heater and a flush toilet. Over the years, the PV system got bigger. I added an inverter and better batteries. Eventually, the old kerosene lamps were put away in the attic. 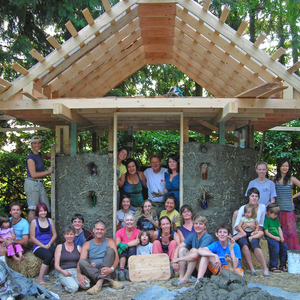 Were hippie builders engaged in green building? I suppose we were, although I’ve never been a fan of the adjective. To this day, I’m not sure what “green” means. If green building is a type of construction that has minimal environmental impact, we were probably fairly green. Most of the back-to-the-land hippies of the 1970s were veterans of Earth Day. We organized recycling drives when we were in high school. We all read the Whole Earth Catalog and Mother Earth News. For advice on construction, we consulted Lloyd Kahn’s Shelter and Ken Kern’s The Owner-Built Home. Since we had no money, we gathered our building materials in the woods and at the local dump. We didn’t pay any utility bills, and we used almost no fossil fuels. 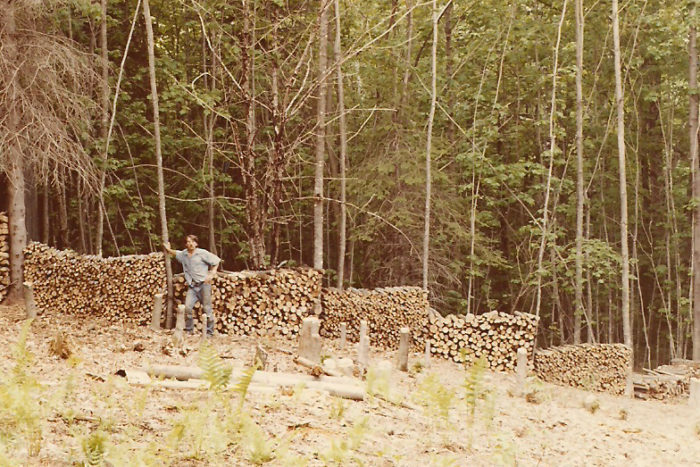 When we were cold, we went out in the woods with a bow saw and cut some more firewood for the wood stove. A few of my friends built log cabins, and later decided that they didn’t want to live in the woods of Vermont. Their log cabins are now abandoned and beginning to compost. I think that the environmental impacts of their construction projects were very small indeed. Of course, when I say that hippie homes were “green,” that doesn’t mean that these homes would have scored highly with any green building program. 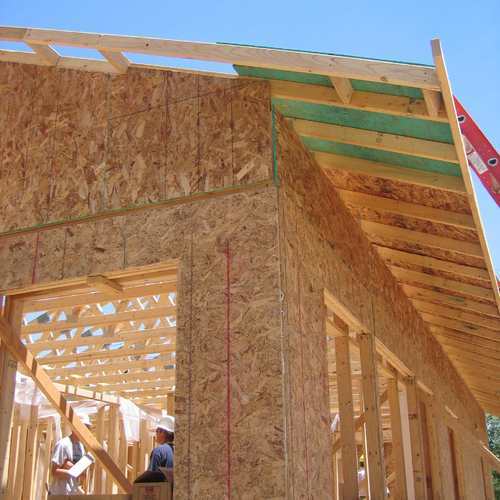 These homes didn’t even meet minimum building code requirements. Clearly, the first home I built (as well as the homes of all of my hippie friends) were miles away from compliance with Energy Star, LEED for Homes, or the Passivhaus standard. What’s the point of all this hippie nostalgia? Well, this reminiscing is relevant for anyone concerned about passive survivability and resilience — two of Alex Wilson’s favorite topics. Resilience depends on two elements: appropriate technology and human behavioral flexibility. 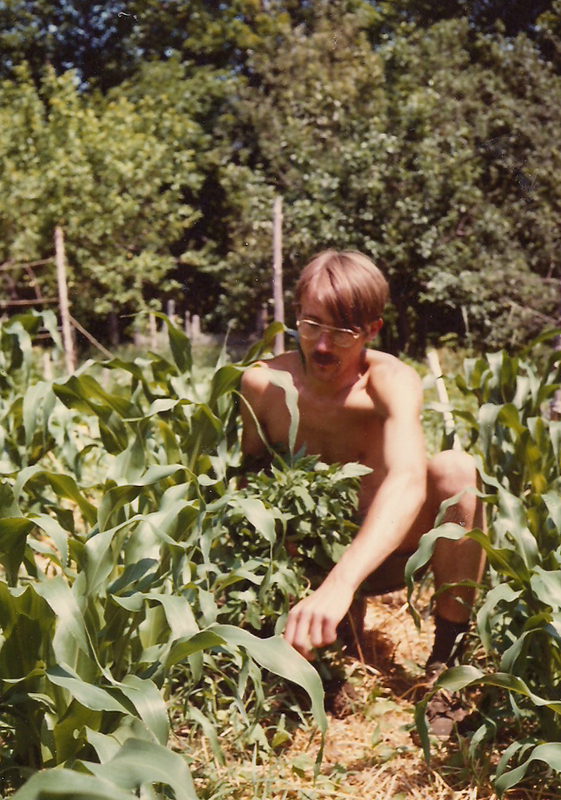 Hippie homesteaders have both, for the simple reason (“ontogeny recapitulates phylogeny”) that we were once frogs. In the old days, we slept on the ground and foraged for dandelions in the woods. In the early 1970s, after all, we all used to live like wild animals. 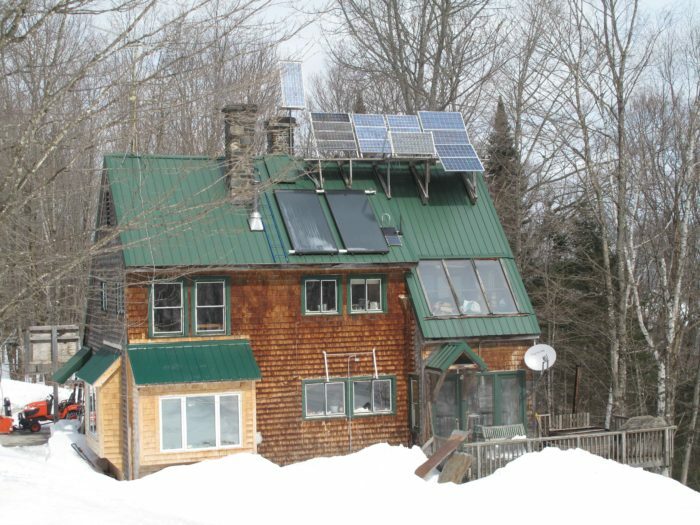 So a few weeks without grid electricity (or PV power, for that matter) wouldn’t faze the average hippie family. If the septic system backs up, there’s always the outhouse. After Hurricane Sandy brought suffering to thousands of families in New Jersey and New York, several news sources reported that wealthy Long Island families were hiring architects to design small off-grid homes to be erected in the back yard, behind the family mansion. The idea was to equip this cabin with a PV array and a battery bank, so that the family might have somewhere to stay during emergencies. In other words, wealthy families realized the importance of building a backyard hippie house. Who would have thunk it? The lessons of hippie resilience aren’t particularly relevant to urban dwellers. Without grid power, urban life can get pretty grim. However, it never hurts to have plenty of extra food, candles, matches, flashlights, and quilts handy — even if you live in a Manhattan apartment. If you live in suburbia, the lessons of hippie building may be more directly applicable. You might be able to keep a few hens in the back yard, or maintain a vegetable garden. 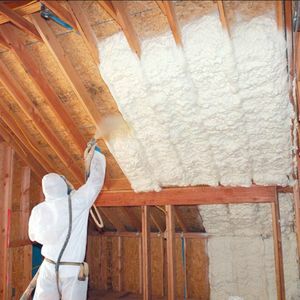 And if your house has a tight shell and lots of insulation, you may be able to ride out an ice storm without worrying about frozen pipes. 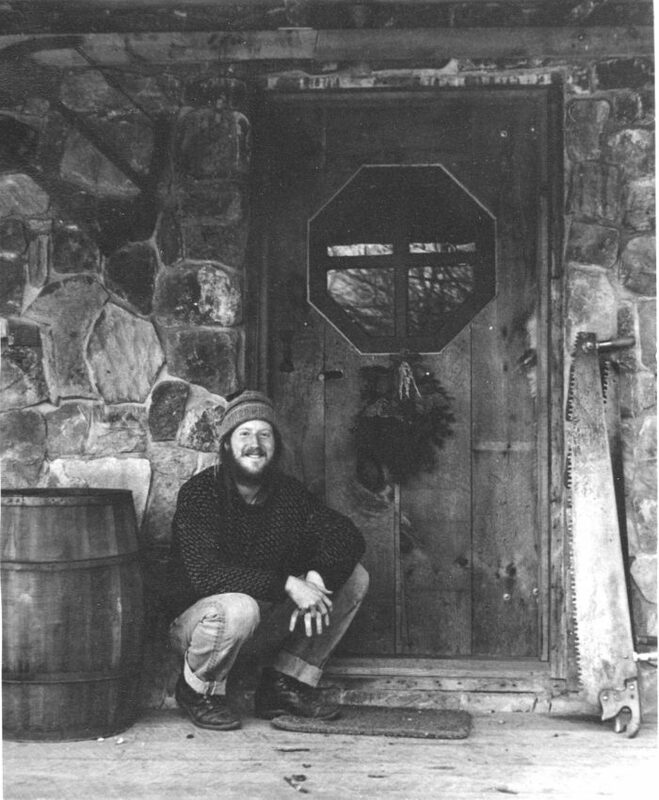 The creative explosion ignited by the back-to-the-land builders of the 1970s was memorialized by many photographers, most notably Art Boericke and Barry Shapiro, who produced a best-selling book, Handmade Houses: A Guide to the Woodbutcher’s Art. In centuries to come, historians will probably note that the era of the hippie builder was the last chapter of a century-long period in American history — namely, the closing of the American frontier. The most exuberant and delightful examples of the hippie houses of the 1970s were improvised and temporary. Similar homes are nowhere to be found in Provence or Tuscany, where stone farmhouses and stone barns are evidence of a deeper relationship to the land than was exhibited by the hippies of the 1970s. While some back-to-the-landers moved on to new ventures after three or four years, others put down roots. If the descendents of these original back-to-the-landers feel as rooted to the land as the farmers of Europe, it’s likely that more permanent homes will eventually be established than those that were thrown together with joy and improvisation in the early 1970s. In some areas of the country, notably California, many hippie builders spent years battling local code officials who strove to condemn and demolish their homes. The tension between the ethic of the frontier — which Americans have often labeled “freedom” — with the requirements of settlement and community — in other words, the world of laws and building codes — is a recurring theme in our country’s history. With every passing decade, the American frontier is shrinking. Although I fully understand the importance of building codes, I can’t help shedding a tear when I consider that the era of hippie building is mostly over. Or is it? Certainly, builders of earthships and straw-bale houses are still with us, so perhaps the hippie ethic is alive and well. Yet the definition of green building is no longer as simple as it once was. Forty years ago, our intentions were simple. We didn’t have much money; we rejected corporate America; and we wanted our environmental impact to be small. 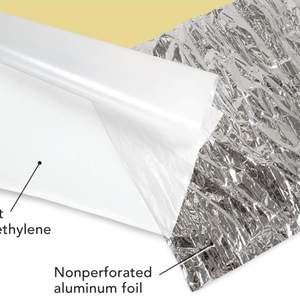 These days, green building is more strictly defined; in most cases, green building programs require adherence to a long list of standards and performance benchmarks. Time moves on, and there is no turning back the clock. I feel privileged to have lived during a memorable and joyful period of American history, one that was creative and unpredictable, and wish nothing but the best of luck to today’s latest generation of green builders. I think your 1974 Hippie House was "delightful". I suspect your current home is slightly more "square" (boxy). How about posting a photo of your current home? My mother is now living in the 1974 house shown in the photo you posted. I live on an adjacent piece of land in a house I framed in 1980. It has a dirt-floored stone cellar, log joists, and a second-floor greenhouse where I start vegetable seedlings in the spring. 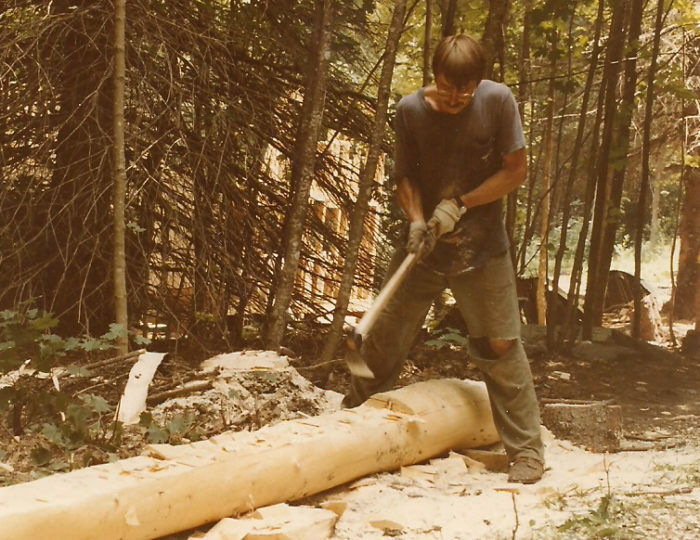 While I never went so far as to build myself a handmade house in the woods, I fondly remember the Whole Earth Catalog, Shelter, and all the other books you mentioned. I pored over them for many hours, dreaming of what I might do someday. 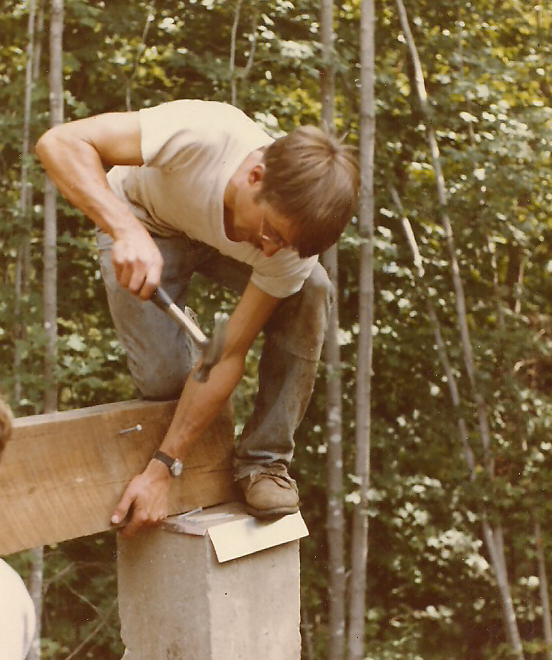 I ended up in the traditional construction industry and acknowledge that I am a city guy, so it is unlikely that I will ever have a house in the woods. My next house, hopefully finally getting started soon, will be as good as I can make it given the constraints of my historic district. Martin, I enjoyed seeing your photos and reading your story. I built my modern hippie house by myself over a three and a half year time frame. I like to call it the "slow building movement." I too lived on the land with no running water or power (for 1st 6 months) and used a small bug infested outhouse. My daughter prefered the woods (fewer bugs). Code enforcement was very lax. I think that there are plenty of people still living that dream. I work with them on a regular basis here at Maine Green Building. 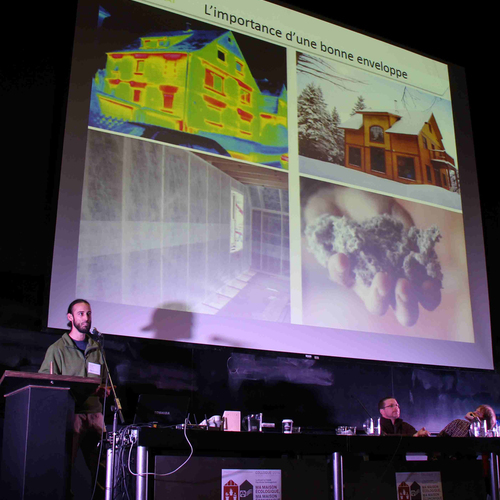 Now there are better windows and better knowledge about how to make a warmer house. Thanks for pioneering the movement. 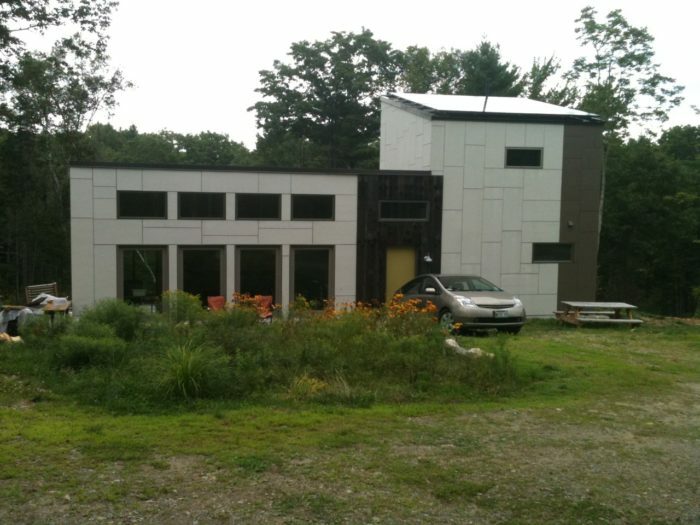 Below is the house I built and a clients house that uses Intus windows and is super insulated. He's building it himself with one helper. Looks like you stayed in pretty good shape just doin' your thing Martin. No need to pay for a gym membership and drive across town to get exercise. When I got ready to make joists, I bought a broadax and an adze. As you probably know, the broadax has one flat side and one beveled side. I never got the hang of the broadax -- it was heavy -- and ultimately set it aside, unused. I cut from the top down to the two chalk lines, thereby scoring the log every 8 inches or so. I used the adze to pop off the top of the log and create a flat surface. I left the rest of the logs unfinished. I'm glad to hear that the hippie ethic is alive and well. Concerning your last comment: give me a break -- I'm an old hippie. It was hard enough for me to figure out how to tweet. I think you are asking too much of me if you expect me to spend more time on Twitter. I'm still getting used to electricity. Martin, I've always felt that the word "green," as applied to building, means approximately what "all natural" means when applied to food: It means whatever the person who's trying to sell you something wants it to mean. But as hippies, we were definitely green builders, especially in the sense that "green" is a synonym for "naiive," "untrained," or "lacking in experience." I think that a lot of mainstream builders think those are still the defining characteristics of green builders, although that attitude seems to be fading. But wait, did you say you had gravity water? We used to DREAM of gravity water. We hauled our water uphill from the brook--using buckets and a neck yoke I carved out of a stick of pulpwood--for about a year and a half. I can still remember how exciting it was to get a hand pump so we could take bucket showers in the poly greenhouse. Your ontogeny/phylogeny analogy is a good one. I've often described it as living 250 years of American history in ten years. Yes, I agree: being green, we all made a lot of mistakes. You weren't the first hippie to sit up suddenly in bed, three years too late, and exclaim, "Shoot! We should have built our house downhill from our water source -- not uphill!" Remember those surge pumps that we used to have that let water run down hill to build momentum and then flipped over to harvest that momentum to push a smaller amount up to a cistern? We could hear them like a heart beat in the meadow thumping away. Good memories! Martin, I forgot to mention how much I enjoyed the photo of you at the block cellar sitting and trying to decide what to do next. If anyone had followed me around taking pictures in those years, they would have ended up with more photos of me trying to decide what to do next than actually doing anything. But as far as water goes, c'mon, I'm not THAT dumb. It's just the the best and sunniest building spot on our land also happened to be on its highest point. Geography is destiny, right? I think a lot of that old hippy improvisational seat of the pants spirit can be found in the "tiny house" movement today. Respose to Jon Vara on "What to do next?" I'm glad you enjoyed the caption to the photo of me staring at the cellar project. I'm sorry for using the water-runs-downhill example in my tale about the hippie sitting bolt upright in bed one night. I didn't mean to cast aspersions on your intelligence. Let's try again. Imagine a scene from a Cheech & Chong movie, or a Furry Freak Brothers comic book. I'll use me as the example this time. The lightbulb goes off! "Shoot -- I should have built a chimney. 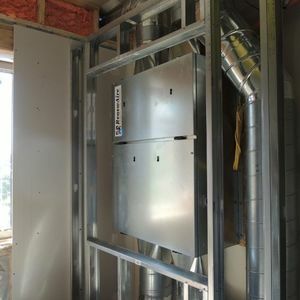 Where do I hook up my wood stove?" A little later: "Shoot -- my drain pipe is frozen! I should have built a cellar." And then: "Shoot -- I can feel the wind coming right through these walls. I should have installed sheathing under the board-and-batten siding." And so on. I never heard the rhythm of hydraulic ram pumps in my neighborhood, but I remember reading about them in all of the back-to-the-land magazines. At the recent Passive House Symposium in Boston, Adam Cohen reminisced, "In those days, we built our own ram pumps out of PVC. Why did we do all of this? Because we were poor hippies." You're right about the "tiny house" movement. It seems that half of the hipsters stuck in an expensive rental apartment in Brooklyn dream of building a little wooden trailer. Michael, you're absolutely right about the tiny house movement. I see it as a really encouraging development. My first house--which is now an appendage to my larger house--was 12'x16', with a little sleeping loft. In about 1980 a magazine editor (remember magazines?) took me out to lunch; my goal was to convince him to let me write a monthly column. In the course of the meeting, he asked me where I lived and I told him and described my house. He thought for a moment and said, "That's not a house--it's a room with a roof." I didn't get the column, either. I think they gave it to a guy who had a telephone. but the young folk I know would want to know about coverage for their smart phone before they touched a tool of any sort. I like your story about sitting upright in bed with "what I shoulda done," but these days it takes a lot longer to sit up, and even the thinking seems more reluctant. I must be about a generation ahead of you, Martin. I too built for myself in the woods. I'm glad I did it. But the thought of being without power, of having to cope off the land, has gone from exciting to challenging to downright scary. It's not the land that changes. And one of the things that speeds all that downhill energy of aging is, as a matter of fact, the way we worked. Fun, yeah. But it takes a toll. Lol, don't get me started on that! Wherever we live -- in the country or in the city -- hard physical labor is a double-edged sword. It improves muscle tone and cardiovascular fitness in our youth, but can (in some cases) cause aches and pains as we age. There is no escaping the human condition, unfortunately. You're right that the backwoods homesteading lifestyle is more difficult for old people than younger people. Loading the woodstove and plowing the driveway get harder as we age. Good luck to you, Joe. I hope your house has a thermostat these days. I'm an old-growth hippie from the West Coast, and I love this thread. I jumped into Lloyd Kahn's books in the late '60s, along with the amazing Whole Earth Catalog (Steve Jobs called it the Google of its day). I think the spirit of self-sufficiency that fired the back-to-the-landers then is still alive and well in the "green" building movement, even though that word just seems about broke from being branded to death. Thanks for this nice side trip Martin. Thanks for providing the link to the slideshow on the Shelter Publications website, which showcases a classic collection of beautifully photographed West Coast hippie houses. 45 year old poor architect here. I grew up with a large pile of Mother Earth News magazines from the 70's that I found in a box. It probably ruined me from ever becoming a RICH architect. 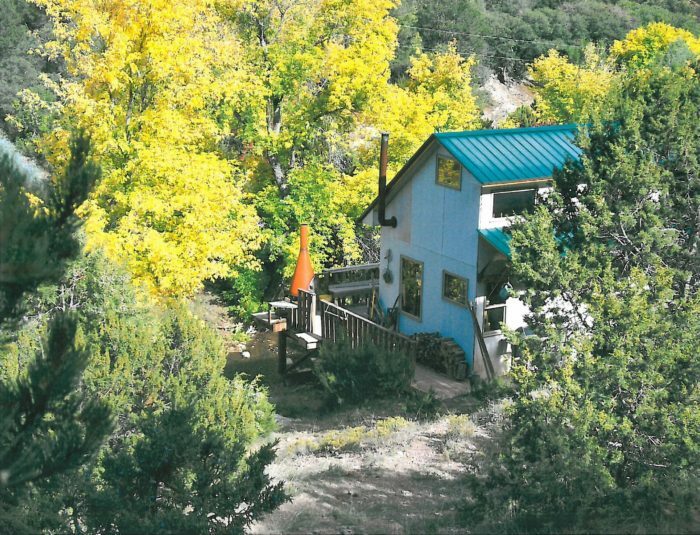 The self-reliant hippies had moved on to normal lives by the time I moved to New Mexico in '86, but their inspiration from the self-reliant Pueblo Indians and Spanish villagers still exists today. My 12x16 cabin-in-the woods was inspired by all three. When people ask if I have running water I point to the creek and say "Yep, there it goes" Purloined materials from subdivsion jobsites contributed to its cost-effectiveness and the hypotenuse of a 12x16 cabin is 20, which is convenient. Thanks for the memories. The communards of northern New Mexico and you New England Hippies looked very similar in the embryonic stage of development, tails and all. Thanks for this great article, Martin. The Handmade House is one of my fave books. I still have my 40 year plus old copy on the bookshelf. I think the natural evolution from that is the Integral Urban House by Sim Van der Ryn. I not only bought the book, but visited the site in Berkley, Ca in the early 80's. 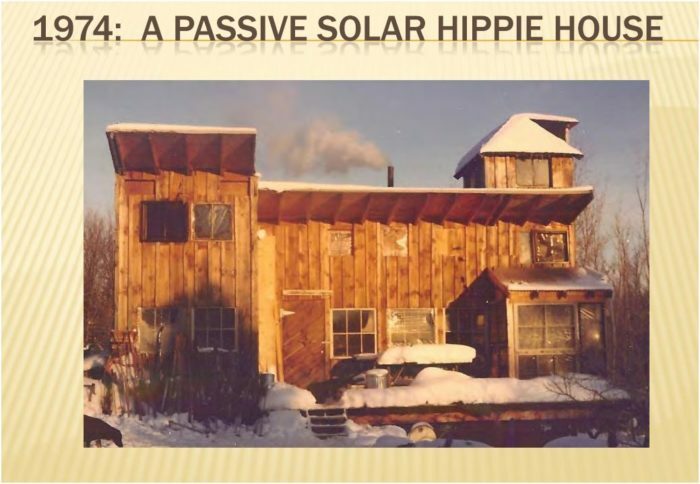 That was a true hippie house, with chickens, tilapia fish, Clivus Multrum composting toilet, cold storage, full veggie garden, and, of course, PV on the roof. Next would be "Build It WIth Bales", "The Hand-Sculpted House: A Practical and Philosophical Guide to Building a Cob Cottage" by Ianto Evans and the Earthship books. These have all proven to be useful guides to me in my seeking a sustainable future. Oh, and don't forget the grandaddy of them all, "Shelter". I have an original edition of that one. Sim Van der Ryn published plans for a composting outhouse. I built two of them -- one on our land, and one for a friend. I ain't no hippy! But my wife is. I wouldn't call it dead, like, a lot of things that came out of that time are gone but the "hippie" building movement still exists. Tara and I moved up here from Long Island, NY in 2001 and did pretty much the same thing as the stories you have from the 70's and man what an eye opener for us both. Coming right out of suburbia, with no money, and into the woods in the beginning of winter with no plumbing or electricity, it was great! A life experience I will never forget. Vermont has Rocks with some dirt, not Dirt with some rocks.Thank Goodness for the Boy Scouts. And remember just because someone moved up here after seeing Bread an Puppet lived in a 15X15 camp for way to long, recycles most everything, has an out house, is off grid, loves driving a VW Camper and as soon as there done typing this there going to work on there bug listening to Zappa don't make em a Hippie! Love the pictures, must have been fun digging them up. I hope you've finished digging holes in Sutton -- it's hard to move some of those rocks with just a shovel. Nobody has mentioned the role of ganja and other psycho-actives in hippie house design. Like my friend doing chainsaw rafter carpentry on acid and, while not cutting his head off, managed to have the corresponding rafters miss by a foot on a shed he was constructing. So the design morphed into a clerestory. Would that be the mutant factor in the evolution/embryo/hippie building theory? Will this be considered respectful content? Clearly, your friend's clerestory was the best possible outcome of his trip ... considering the possible alternatives. He must have a guardian angel. Martin -- I loved this article. Thank you. Full disclosure, I am a Millennial. I have great respect for the environmental progress due to your generation (which is my own parents' generation). I wonder, though: If "you" (Hippie generation, generally) could do it over, knowing what you know now, what would you do differently? I'd love to hear from other readers, too. As a researcher in environmental and sustainability sciences with the luxury of hindsight, I've always felt the biggest drawback to the Back to The Land Movement (which seems the focus here) was its exclusivity -- both socially and spatially. This limited its appeal and prospects for growth, but, more importantly, led to some stunning environmental inefficiencies. Not so much, perhaps, in narrow building techniques (leaky geodesic domes excepted), but because it eliminated serious economies of scale that a world of 7 billion people HAS to take advantage of: growing of organic grain, generation of clean electricity, distribution of clean drinking water, necessary local transportation -- all of those, if done well, can be done much more efficiently (in terms of time, money, and toil) by a society in a circumscribed space than an individual (or even a commune) out in the woods. My all-time favorite book hails from the 70's: E.F. Schumacher's "Small is Beautiful". I imagine most Hippies will remember his essay on "Buddhist Economics" (indeed, a classic), but his other work was arguably more important: especially his observation that the optimal size of human settlements, from a sustainability perspective, is probably in the neighborhood of 150,000 people. Large enough to reap the most advantageous economies of scale and specialization, but small enough to retain the social and environmental benefits of small-ness. I agree wholeheartedly agree that the Tiny House movement could combine the best of both worlds: taking the ethos and building techniques engendered by the Hippies and combining it, thoughtfully, with the benefits of scale and (appropriate) technology. And I see I have digressed terribly! Thanks again for all your work! I'm an avid follower. Speaking personally, here's my own hindsight observation: I wouldn't change the path of my own journey. As Edith Piaf sang, "Je ne regrette rien." But clearly, that's not what you're asking about. E.F. Schumacher got a lot of things right. Fortunately, back-to-the-landers and hippies don't have to justify their philosophy or defend their errors, because hippie philosophies were all over the map. We were a bunch of leaderless anarchists. One strain of thought from the 1970s which seems to me to have been misguided was the attempt by many to attain "self-sufficiency." With maturity, many of us realized the blessings of community and mutual aid. It's OK to depend upon your neighbors. Each family doesn't have to strive for self-sufficiency. A final observation: if a tiny house is a little 7 ft. by 10 ft. cabin on wheels, it isn't going to be very efficient. Multifamily housing makes a lot more sense than little tiny homes on wheels. I also enjoyed Adam's presentation for his story and spirit of invention, and yours here. In contrast, I grew up in the 1st planned suburb of North America, where my family's radicalism was of consciousness exploration rather than of the back-to-the-land variety. Both were about a detachment from the mainstream, though one more fully unplugged from it. I took a middle path and found architecture as a means of expression and invention. To get our hands dirty, a colleague and I formed a building company in a city for a time. The allure of design burned strong, and later on I found a 2nd home market that was open to it. 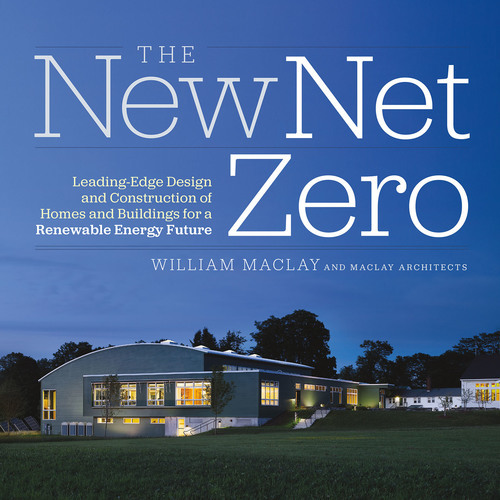 NESEA has been an important challenge to me over the years, as Passive House has become. At this time in my life and in our culture, I think the search for meaning is circling back. By necessity or choice, a simpler life has appeal. Sweat equity, and creative living arrangements are more in conversation. For GBA, NESEA, and green building in general, I think technical solutions alone are insufficient for collective progress. It's important to share our stories and our searches for meaning, beauty and truth in what we do. Synergies of use & purpose can sometimes trump technical sophistication. Thanks to you and all who hold space for the big picture while delving into the details. You wrote, "I think technical solutions alone are insufficient for collective progress." I couldn't agree more. The "better living through chemistry" era (which, for the DuPont Corporation, lasted from 1935 until 1982) is over. We're not going to solve our problems by building a better PV panel or ductless minisplit. I’m guessing I may be 20 to 25 years your junior so naturally I took a page out of your generations book. When we started building we struggled just as you described above (and still do to some degree) and the photos you posted above could be tossed in with my collection and no one would know the difference. I love it. Now that I'm in my late 30's, I have friends in there 20’s ask me what an adze is and how to use it - just like I asked my neighbor (who thrives in his early 70's built timber pole house) up the road 10 years ago. With questions like that, I don't think the "back to the land" spirit will ever fade and I do think the information and wisdom passed along will only make our "hippie homes" better with time. Like you said above, yesteryear's green buildings wouldn't have scored high in any of today's programs…but to be honest…none of those programs score high in my book. My house might very well out perform those that are "certified green" but it would never pass the rigors of evidence that show I milled the lumber from trees that once stood over there (pointing) and that the straw bales used were manufactured to an exacting tolerance. And really...that’s fine...because once I knew I would never be certified, it allowed me to cherry pick between the two worlds of yesterdays “hippie building” and today’s “green building” with its energy efficient windows, on-demand hot water, super low flush toilets, properly drained foundations, storm water control measures, and greatly improved photovoltaics and batteries. All the goodies that were unavailable (to some extent) in the 70’s are now common place thanks to your generation. Thank you. So now, for me, the pioneering drive was to take a step back from the overly codified green world and build something so simple and so efficient, it is often overlooked as being too hippie. When building I consider being called a hippie something of a compliment because if you’re not being called a hippie, you’re not trying hard enough. 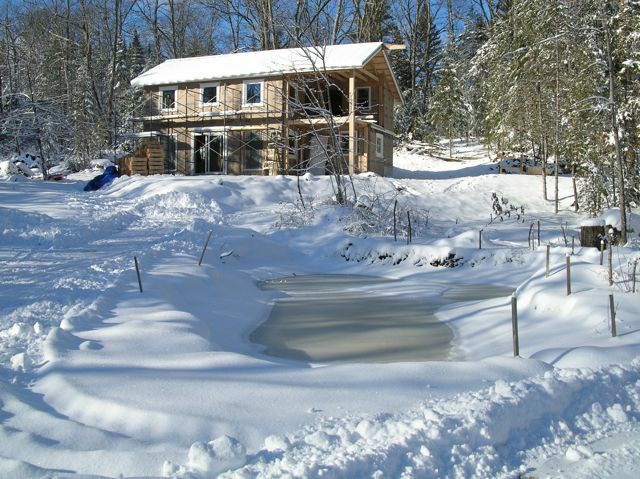 The challenge (beyond the physical demand) was to counter what the local building inspectors had come to know as “green.” After so much debate and headache we were finally granted approval and my wife and I now have the first off-grid, self milled timber frame/ straw bale home in the area…with a certificate of occupancy. Freedom? Yeah sure. So just like the nostalgia felt in the 70’s for a simpler way of life, I hope every upcoming generation will have those that pine for a simpler, greener time and wonder why they weren't born in the previous decade. They’ll take a look back, see my place, (as I saw my neighbors) and then challenge themselves (and conventional wisdom) to build a hybrid house made with reclaimed SIPs, hoarse dung and R-80 windows. A candle will be there only back-up heat and I’ll be buckled over with a bad back calling them hippies. Thank you for this wonderful piece and the reminder that green building and particularly the "100 Mile House" concept has some roots in the "back to the land" era. 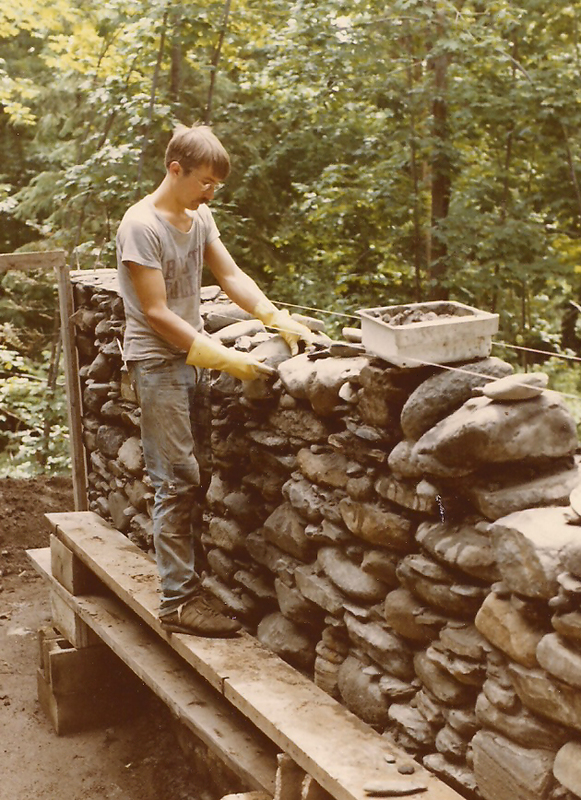 I built my first house, a stone house in Northern New York, in 1975. We dug the cellar by hand, the stone came from old stone walls within a few miles of the site, we cut spruce trees for joists and rafters from the nearby forest and brought them to the site on our shoulders, the planking came from a local sawmill, the doors and windows were either handmade or recycled, and the finished flooring was recycled, too. The only things that weren't locally produced or sourced were the nails, mortar mix, and roof membrane. 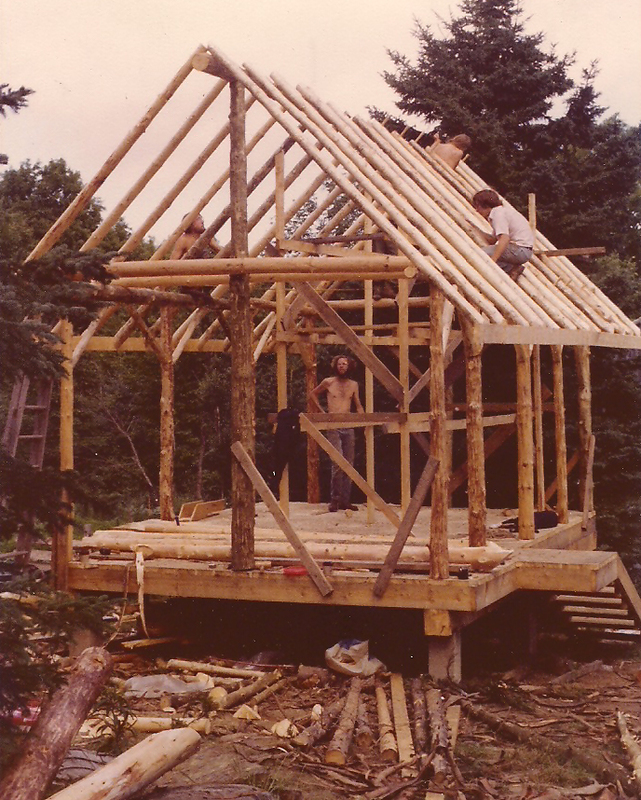 The house was small, there was no mortgage, and it was easy to heat with wood (the sod roof helped). But if you go back far enough, most buildings were products of the places in which they were created. Where there was natural stone, people used stone; where there was clay, people made brick or adobe; and most every community had a sawmill and people who could make doors, windows, hardware, and even nails. And the power to do all this came from rivers, wood, charcoal, animal and human labor. I'm not trying to romanticize this era (just look at the pollution or treatment of women and minorities) but it seems we are in some ways needing to return to a 21st century version of this smaller, simpler life.